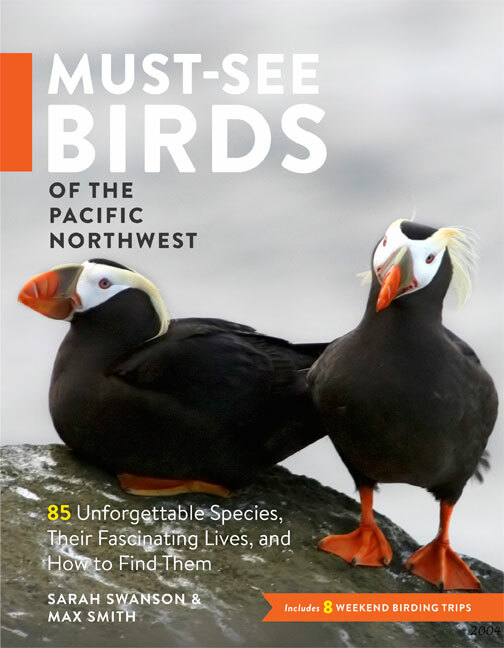 As you can read on the cover, the book showcases 85 species that can be found in the northwest. Mind you, these are not necessarily birds that can be found only here but also common birds that can be found across the country. In some ways it's a book for beginner birders and I imagine for a Portlander, it would make an excellent companion to the pocket-sized Birds of the Willamette Valley, a book I used every day when I started birding. The birds are organized in a way I bet you have never seen before. Not by color, not by taxonomy, not by alphabet. Nope. The birds are broken down into sections such as Big Birds, Tree Trunk Birds, and my favorite, Killer Birds. The Great Blue Heron pages are not near the Green Heron pages. It's a unique set-up for sure. The last section is the one that I am most excited about- Weekend Birding Trips. More than half of the 8 well thought out trips are to places I've never birded. I can't wait to start planning trips to Central Washington, the Salish Sea, Puget Sound and the Klamath Basin! So while I am obviously quite biased in my thoughts on this book, I will say Sarah and Max did a great job making this a really fun book to look through. They also did a great job selecting photographers- I am in amazing company with Scott Carpenter and Greg Gilson and others. You should go buy a copy. It's not expensive. You know you want to. Available locally at the Audubon Society of Portland and Powell's! DO IT. Now for some photos... I walked the dogs along the Columbia Slough Trail on Monday afternoon hoping for shorebirds. Not many to speak of, but I did see something new. A Red-tailed Hawk was perched on light pole at the raceway while two Osprey flew around together nearby. The hawk started calling. One of the Osprey came over and started harassing the hawk. The hawk took off and the Osprey chased it, dive-bombing it till the hawk made it into some trees. I missed some of the action because my left hand was occupied with binoculars, two leashes, and a bag of dog poop, but you get the idea. I can't remember ever seeing an Osprey acting as the aggressor in a situation like this. It was interesting. Congrats on your pictures being published. Sounds like a great book for your area. Love the action capturing the Osprey and Hawk. Great action photos. Congrats on your photos being published, Jen; that rocks!!! Sweet action captures. JEN...Fame looks great on you!! WE know brilliant when we see it why do you think we keep coming around? LOVE this attack sequence...I mean he passed out the "get the hell outta Dodge" message very clearly! OH I noticed in one of your profile pics you were holding a bag of poop, Loved IT!! Thanks for the book review, Jen! I'm glad we could do your photos justice. That's a cool series of photos. Have the moth eggs hatched yet? Just wondering. Congrats, Jen, on having your photos published in the book! That is an awesome action series you caught. Wow!